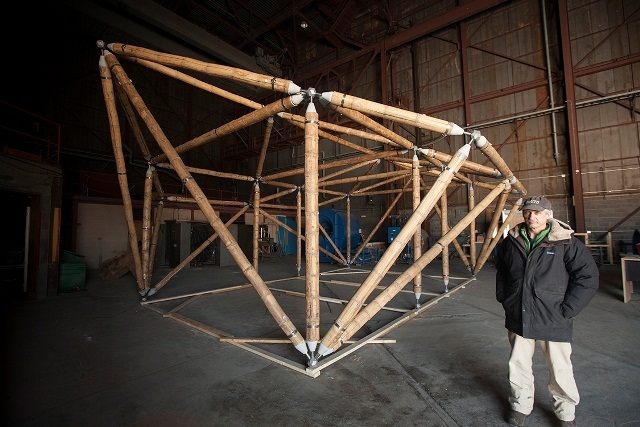 A versatile architectural technology created by a Cornell design professor has been adopted by sustainability-minded students to build bamboo-based hurricane- and earthquake-resistant structures where they’re needed most. The first field test of Design and Environmental Analysis (DEA) associate professor Jack Elliott’s “Triakonta” structural system stands in the Punta Cana coastal region of the Dominican Republic, as an outdoor classroom for the Puntacana Ecological Foundation. “The structure itself is elegant and has sparked dialogue about sustainable architecture amongst visiting guests, students and even architects,” said Jake Kheel, M.S. ’02, environmental director of Grupo Puntacana, which operates a resort adjoining the eco-preserve where Cornellians and locals built the bamboo structure in mid-2015. That type of bamboo is called Guadua (pronounced gwah-dwah), a fast-growing, large-diameter variety from the Amazon basin that Chris Dennis ’13 hoped to cultivate in Haiti. Dennis had transferred from McGill University to Cornell, where the young filmmaker was studying communication as well as international agriculture and rural development. He asked for Elliott’s help designing sun-shade nurseries for the tender bamboo sprouts – and the DEA professor, who is trained in architecture and industrial design, knew he’d found an application for his Triakonta technology. Named for the triacontahedron – a 30-sided rhombic polyhedron first depicted in the 1600s by mathematician Johannes Kepler – Triakonta metal nodes (fasteners) hold together struts (framing timbers) in nearly any orientation a designer can imagine. Combining cast-aluminum Triakonta nodes with bamboo struts of three different lengths, Elliott’s structure can be assembled anywhere, in all shapes and sizes, and disassembled later for subsequent reuse. Elliott, a College of Human Ecology faculty member since 1998, invented the Triakonta system after he was asked to design a multipurpose building for the Ithaca Children’s Garden. Elliott’s initial designs weren’t “figurative enough” for administrators at the garden, which features a giant, earthen playscape in the shape of a turtle. “They were thinking of something more biomorphic, like a giant bumblebee,” Elliott recalled, and at first he was taken back: “I’m a serious designer. I don’t do bees.” On second thought, Elliott relented and came up with a critter-shaped design that would wrap around a circular garden and rise with a tower – “not unlike an otter raising its head and looking back on itself.” The building was designed as a geodesic space-frame structure – using black locust, a locally grown, low-demand hardwood, and offering plenty of space for photovoltaic paneling, too. The Triakonta otter has yet to arise, and that’s why Elliott was thrilled to find students with a dream: to leverage the virtues of bamboo (fast-growing in tropical climates, strong and durable, sequesters carbon) plus an affordable, modular, reusable structural framing system for community builds. Schools, medical centers, recreational facilities, disaster-relief housing – the needs are practically endless. “We didn’t want this technology to be just for the rich to enjoy,” Elliott said, noting that the Punta Cana resort offers vocational schooling for children of its Haitian employees. Along with turf management, hospitality and culinary skills, Haitian schoolchildren can learn to grow and build with Guadua bamboo, he suggested. Tragically, Dennis didn’t live to see his sustainably harvested bamboo vision to fruition. He disappeared from an overturned canoe, May 22, 2013, as the sun was rising over the deepest, coldest part of Cayuga Lake, just days before Cornell graduation. Now the Puntacana Ecological Foundation’s bamboo classroom has been named for Dennis. And Elliott has plans for an engaged learning curriculum in sustainable building practices. Each fall semester, he hopes, students will design public facilities with the Triakonta system and work alongside residents in community-build projects during winter breaks. A follow-up course in the spring would be devoted to project analysis and reflection.